I love stuff like this. Notice the location of the sidewalk sale: INSIDE. Doesn’t having it outside in front of your store make it a sidewalk sale? If it’s inside it’s just a “sale,” right? I could understand if it was raining, but it was a nice sunny day, each of the two days I happened to see this sign. They’ve got the sign up again this week too. And I’m not going to complain that “IN SIDE” is all one word. I’m not going to complain about anything. I am nothing but amused. Maybe they’re selling sidewalks inside?!! 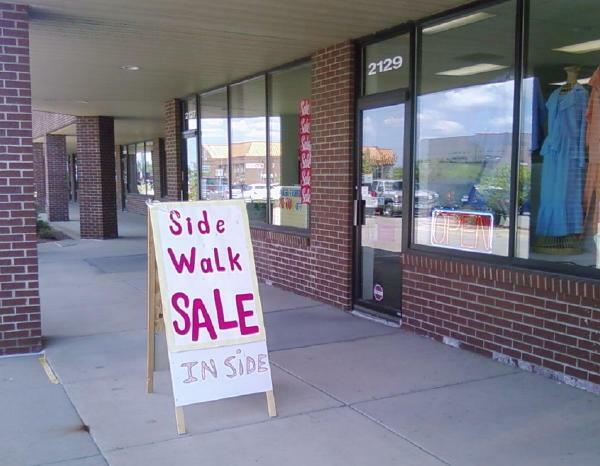 I dunno, it seems to me that they are selling walks on the side somewhere …….. So glad to hear that others see these signs this way!